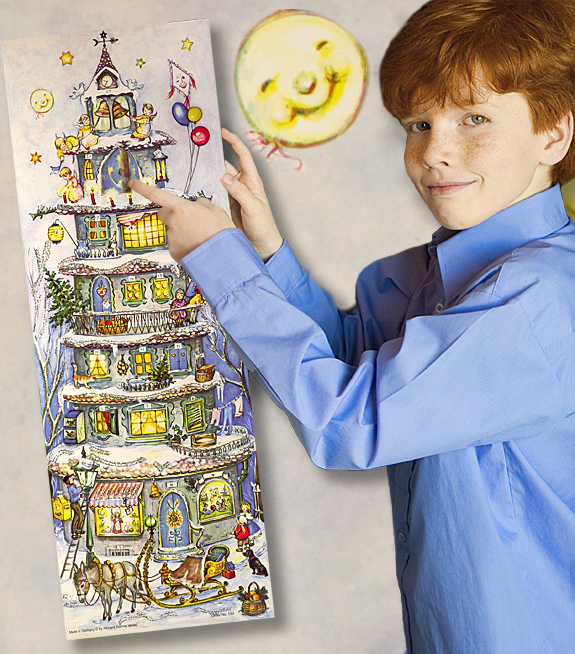 Measuring 8.25 inches by 23.5 inches, this colorful advent calendar comes with an envelope for mailing. Gabriel loves surprises -- and there are 25 in our Advent Calendar. So, opening all those little windows should keep him busy for a while. How did we get Gabriel to sit still long enough to have his picture taken with his Bell Tower Advent Calendar? Simple: we promised him that, afterwards, he wouldn't have to wait until next Christmas to peek behind all 25 little windows! We know you're capable of more resolve, because part of the fun of theBell Tower Advent Calendar is counting down the days 'till Christmas. You start with Window No. 1 — which, actually is, a shop window with a striped tent— where an angel in red is playing his violin. Then, perhaps, the lamplighter will let you use his ladder, because you need to climb on the tile roof of the first story to find Window No. 2. Do you see it next to the bird cage? Can you find "Window" No. 3? Actually, for your child,opening windows is only half the fun — the other half is finding them! So, in between-window peeking, you could play a game of "Where's...?" 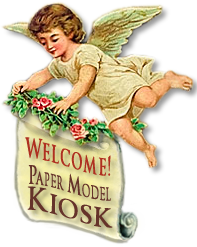 and naming one of the wonderfully drawn angels, children, bird cages, lanterns, balloons, bells,birds, stars, candles, or the cat, clock, or kite. Whew! If we had trouble finding them all, think of what delight awaits your child. At almost 24 inches,theBell Tower Advent Calendar may very well bit taller than child. But, who's counting? Tape it low on your child's door — within reach of small arms. And watch as it proves endlessly fascinating to young eyes. It took six wonderful stories to fit all of those windows in — seven, if you count the cupola that tops this wedding cake of a bell tower. But while your eyes automatically look up, take a moment and enjoy the one-donkey open sleigh. We couldn't resist including a crib sheet, err, we mean a rather large, whole, image of theBell Tower Advent Calendarfor your — and your child's enjoyment. And practice session — while waiting for your realBell Tower Advent Calendartoarrive! Just click the "More Pages" banner, to the right, and start looking for "Window No. 3." As Christmas approaches anticipation builds — what is hiding behind all those little windows? Size: 8.25 x 23.5 inches.